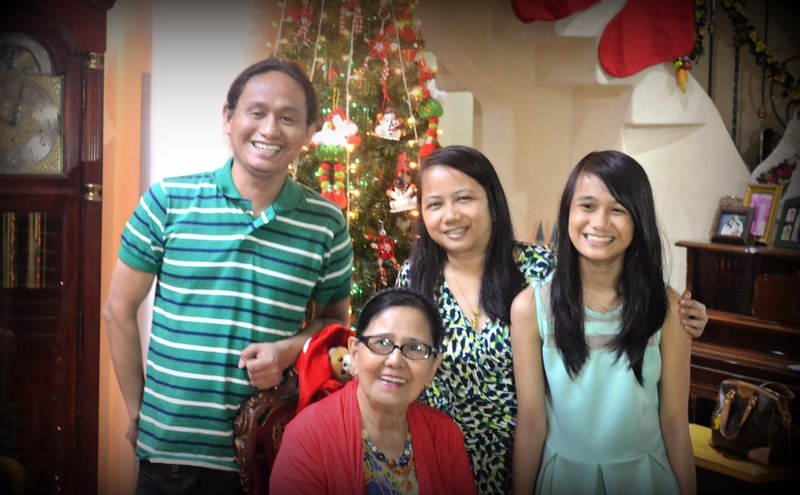 A family gathering during Noche Buena is sacred when it comes to my father's side of the family. We've been having a Noche Buena feast since I was still in my diapers, and my lolo and lola were still alive back then. And thru the years, when lolo and lola were long gone, we still continued the annual tradition and this year is no exception- ho ho ho. Fried Chicken. Skin was crispy but the meat inside was nicely cooked and tender. I don't know how she did it but my aunt's new cook is a kitchen-fairy! No need for gravy, too. Can't control myself from eating tons of this and asking my aunt for some take-home after the party. Beef Mushroom. A delicious creation by my aunt. She's a wizard and the kitchen is her turf. Although this dish is usually paired with rice, I find it "bagay" with spaghetti noodles so this served as my special sauce. Yum! Savory Fried Chicken. I cooked this! Hahaha. Daughter was craving for this so we brought some. Benson's Pork Barbeque. One of the best and meaty barbeque's in town. It comes with a "killer" dipping sauce also. Rellenong Bangus. I don't know what happened to the shape but it was delish nonetheless. This is a big hit with the adults (healthy eaters, daw). Veggie Salad. For the health conscious. There's also my cousin's famouse spaghetti, and a box of chocolate moist cake. Not in the photo were the special kakanin (biko and sapin-sapin) from Cainta, buko-pandan salad, hot cocoa (tablea from Davao), wine, chocolates, homemade pastillas. Not sure if I missed a dish or two. During past Noche Buena feast, we have turkey (goodbye Mandarin Hotel), kare-kare, lechon, lengua, chicken relleno, etc. We usually alternate the dishes since there are tons of birthday celebrations also during the whole year. But this year, instead of waiting for Noche Buena, we had a late dinner. That's around 9pm when the whole family are already present. Dinner ended after two hours and then its time for our annual family bingo- yey! Merry Christmas! Ang sarap naman nang handa. Gusto ko din mag handa for Noche Buena kaso hindi ako marunong magluto. Hahaha! Ang sarap nama ng Noche Buena feast niyo. May annual Bingo din sa house hehe Parang tradition na ata yun eh , di ba?